On Monday, August 31, State Senator Tom Duane addressed a rally and press conference across the street from Governor Paterson's office in support of the Department of Health HIV/Hepatitis C Oversight Bill (S.3842/A.903), which he sponsored in the Senate. 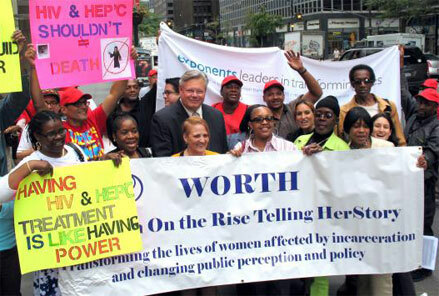 The event was organized by the Correctional Association of New York, the Women’s Initiative to Stop HIV/AIDS-New York (WISH-NY) of the Legal Action Center, Gay Men's Health Crisis (GMHC), Latino Commission on AIDS, Women's HIV Collaborative, and Women on the Rise Telling Her Story (WORTH). Passed unanimously by the legislature, S.3842/A.903 directs the State Department of Health (DOH) to oversee HIV and hepatitis C care in New York's prisons and jails. It takes a critical step toward rectifying a long-standing and problematic inconsistency in state health policy: while DOH monitors hospitals and clinics in the community, it does not oversee medical services in New York's correctional facilities. Health facilities in prisons and jails are the only substantial public health institutions in the state exempt from mandatory, independent assessments by DOH. This inconsistency persists notwithstanding that almost 90,000 New Yorkers are in jail or prison at any one time and more than 300,000 cycle through the state’s prisons and jails each year. S.3842/A.903 authorizes DOH to conduct annual reviews of HIV and hepatitis C care in state and local correctional facilities, to mandate necessary changes, and to publicly release annual reports on correctional care. New York has the largest number of HIV-positive incarcerated people and the second largest number of HIV-positive incarcerated women of all prison systems in the country. Over 97% of the state’s incarcerated population will eventually return to the community. Under S.3842/A.903, DOH would begin monitoring state prison care immediately and local jail care two years later. DOH estimates that oversight of HIV and hepatitis C care in the state prison system would cost $686,000 – a small price to pay considering the bill's projected long-term cost savings and positive impact on individual and community health. Said Senator Duane: "This is 2009. It is regrettable that we even have to have this discussion. New York’s correctional facilities continue to have one of the highest national rates of HIV and Hepatitis C infection. Yet the Department of Health (DOH) exercises little oversight as to how these two infections are monitored and treated within our prisons. As a result, inmates receive different, and too often an inconsistent, standard of care than other New Yorkers who are provided the protections of DOH oversight. This is wrong. The Governor must do the right thing and sign this bill into law." The bill's Assembly sponsor Assemblymember Richard Gottfried and bill co-sponsors Assembylmember Jeffrion Aubry and Senator Ruth Hassell-Thompson also addressed the crowd, along with formerly incarcerated individuals, advocates and Dr. Lambert King, Director of Medicine, Queens Hospital Center and national expert on correctional health.